So, you have had just about paid your dues when it comes to the amount of work that is done at the office, so much so that you would like nothing better than a holiday on a tropical island somewhere. Unfortunately, your work schedule does not permit you to do so, which is why you would just have to laze around at your home’s pool, or at a nearby resort. Why not melt away the tension and frustration with the $9.99 Palm Tree Drink Rafts? After all, swaying palm trees (coconut trees will also do) and the soothing sound of waves breaking upon the shore is pure bliss. Let your favorite brand of “poison” float slowly but surely around you, as you just melt in bliss and happiness. 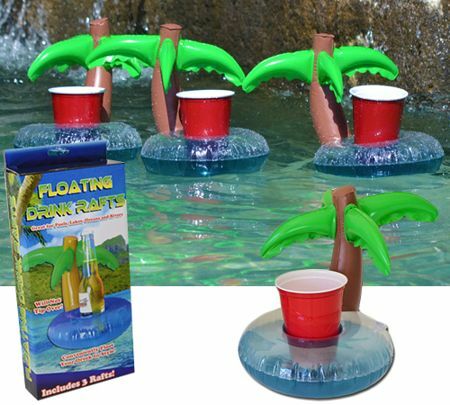 The Palm Tree Drink Rafts takes mere seconds to inflate and deflate, where each purchase comes in a set of three, and can handle just about any size beverage, save for a beer tower, of course.